Simply You Wellness Spa uses: Keyano Aromatics Cranberry Mineral Bath, Cranberry Scrub, Cranberry Oil, Cranberry Bog Mask, Cranberry Butter Cream; base coat, polish, top coat. 1. Massage your client’s back while she enjoys a cup of hot cranberry tea. At the same time, soak the client’s feet for 15 minutes in warm water with Keyano Aromatics Cranberry Mineral Bath. 2. File the client’s feet. 3. Warm Keyano Aromatics Cranberry Scrub in a hot towel caddy. Exfoliate the client’s feet and lower legs with the scrub. 4. Warm Keyano Aromatics Cranberry Oil in a hot towel caddy. Massage the client’s feet and lower legs with the oil. 5. 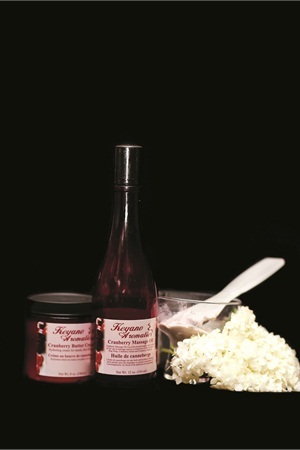 Apply Keyano Aromatics Cranberry Bog Mask to the client’s feet. Wrap the client’s feet in warm towels. Remove after the toenails are prepped. 7. Warm Keyano Aromatics Cranberry Butter Cream in a hot towel caddy. Massage the client’s feet and lower legs with the cream. 8. Apply base coat, two coats of polish, and top coat. Cover the feet with warm towels while the toes dry. By Simply You Wellness Spa, Massena, N.Y.
Diamond dust is the material leftover from cutting diamonds. Its hardness makes it desired for a wide variety of uses.